In this article we will show you, How to write a C Program to Put Positive and Negative Numbers in two Separate Arrays using For Loop, While Loop, Functions with example. This program allows the user to enter the Size, and the row elements of One Dimensional Array. Any number that is greater than or equal to 0 is a positive number. If condition will check whether the same. If the condition is True then it is a positive number. So compiler will assign that element to Positive Array at first position, and next it will increment the Positive_Count value. If the condition is False then it is a Negative number. So compiler will assign that element to Negative Array at first position, and next it will increment Negative_Count value. 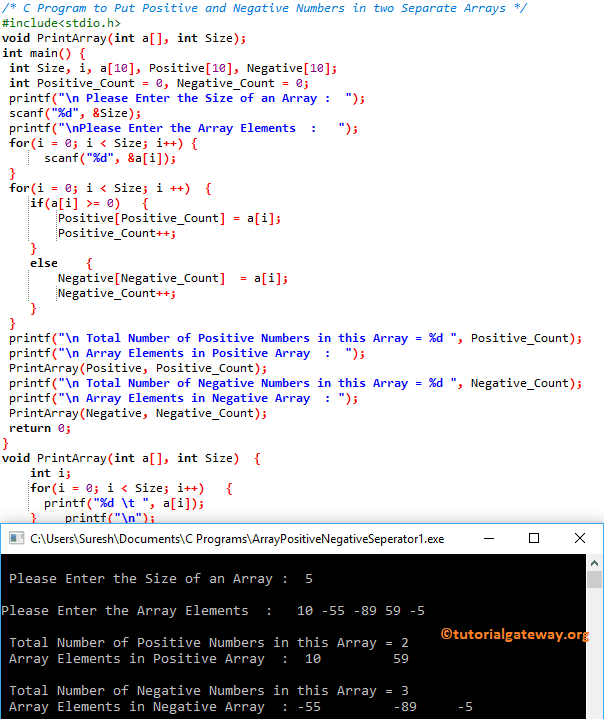 This program is same as the first example, but we separated the logic to put Positive numbers, and Negative Numbers in two separate arrays using Functions.